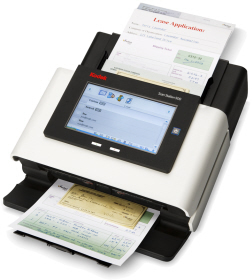 The smart, fast, easy, friendly, quiet, secure KODAK Scan Station 500. Send information. Not just data. Our exclusive Voice Attachment feature gives you the option to record and send essential directions with your documents. Make sure everyone gets the message. With one scan, send a document to the network, to e-mail, to the printer, to fax, to a USB drive, and to FTPsimultaneously! The large 20.3 cm (8 in.) LCD touchscreen makes it easy for everyone to scan and share. Copyright © 2019 E File UK Ltd.